Going for a fun and friendly look this Halloween? Why be the scariest in town when you can be the hairiest? (And we mean that in the best way possible!) Grab this Plush Storybook Costume and you’ll look as if you just entered the party scene from some strange and mystical land where fables and fairytales are a part of normal, everyday life. This costume will make for a quick and easy Halloween transformation. The gray jumpsuit has a fluffy tail attached to the back and the four paws have elastic at the ankles and wrists to secure your hands and feet. Then, after you get some help with the zipper on the back of the costume, to complete your new plush look you just need to toss on the soft sculpted and fuzzy headpiece. 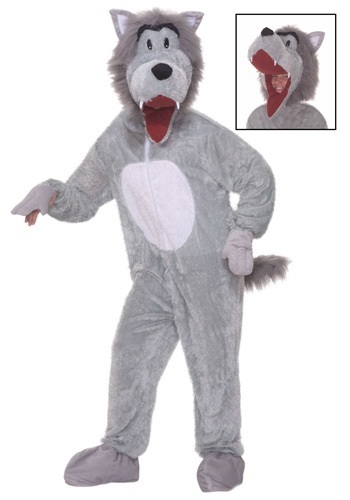 Pair this costume with your youngster or significant other’s Red Riding Hood costume. You could even have a group of friends dress up like the three little pigs. One of the nicest things about this costume idea is that it doesn’t need any props! You won’t have to carry around anything with you except a friendly storybook-like attitude. You’ll look so kind and charming in this costume that you won’t need to worry about anyone blaming you for eating their grandma. If you’re ready to show everyone not all wolves are scary and that some of them just want to party, grab this Plush Storybook Wolf Costume. You’ll be the first wolf who doesn’t need sheep’s clothing to be invited in!